I have to give props to my local ABC Meteorologist, not that I am happy about it. He called it on severe weather missing our area to the west and north last night and to the southeast today. Well this crapped out from 80-100% chances just a few days ago. Now it is 50 degrees with low clouds and a cool north wind. Boring. Didn't even get a drop of rain. It's actually encouraging that the sun is out right now, even if there's thin clouds too. That may give us enough heating to have development over here. So models are pretty consistent with a linear storm mode thru here tonight. Linear systems are fun. Not as fun as supercells, but still fun. And discrete supercells can't be ruled out. SRH values of ~250 m2 s-2 at 0-1km would suggest embedded rotation within said line as well. 41kt shear isn't too shabby either. Shame it's at night. Bet this thing will have a killer shelf cloud. If we go by HRRR's word, though, we'll be looking at a hail only threat here. BOOOOOOOOOOO. Let's go WRF models. Another crazy temp difference from my high and low yesterday (79/29). Currently, sunny and warm w temp @ 70. Making a run for 80F or betta. Today will be the first 80° of 2018 here in Grand Rapids. The last time it was 80 or better was back on October 9th 2017. Over the years the mean first 80° at Grand Rapids is April 30th so it is just about the average time of the first 80° day. I think North Central/Northeast Kansas, Southeast Nebraska are prime areas for severe weather. My area is north of the front so my chances appear to be 0%. This is a fairly typical setup, it seems fronts usually make it just past the Tri-Cities of Central Nebraska and then tend to stall out. Seen this many times over the years. I'm sketched out by the thick clouds we have now. South wind may help us rise a couple degrees but I'm worried about us being able to break the cap. Gorgeous, sunny warm day w temps in the 70s. Already hit 80F and making a run into the mid 80’s. The air has that dry AZ heat feel to it which is making my skin darn dry. Everything is pretty dusty outside. Can’t wait for the rain tomorrow to wash this out. 70F here under hazy skies. But it’s only 40 at Int’l Falls. Trees are in full bloom. They all popped within the last day or two. It’s no coincidence that I’ve sneezed a few times the last few days. 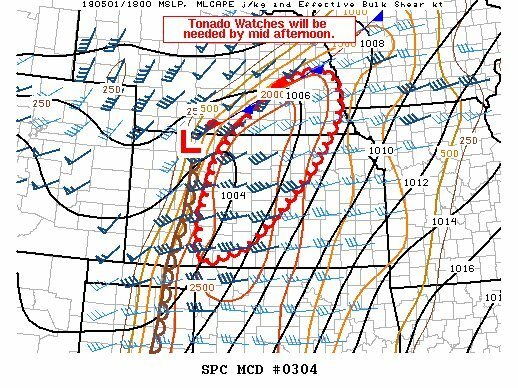 Not sure what the motivation behind a MDT risk for N/C KS was. If they wanted to add a 15% tornado risk there then it'd be understandable, but I don't get the 45% hail risk. If anything hail risk there would be less than here cuz it's gonna be more isolated down there. Ahhhh yes this sunlight is just what the doctor ordered. Temps rising quickly. May actually see development closer to here as the cap should erode soon. 81.3*F. Dew point 62*F.
Still very overcast in Omaha. Looks a bit dicey for the St. Joe area tomorrow. Tornado watched just got put out. Also, a storm in Kansas just popped out of no where and became severe rather quickly. Let the night begin. Some just popped up from seward to columbus too. Should be a fun night. HRRR looks rather juicy for some discrete supercell action. That was also a rather strongly worded tornado watch from an SPC that has been rather nonchalant in its outlooks. Let's do this. Just as I predicted, Tornado Watch one county to my east. Not that I want tornadoes for anyone, but now will get to watch the thunderheads billow up just to my east and southeast. Has happened before. Gabel23 be careful out there man, that is some strong rotation right by your place. Every form of interesting weather goes around Lincoln part 245864235987432 is about to go into effect. Waiting patiently to see my next move, might not need to move much to see some action. Earlier had quarter sized hail and got .90 of rain in like 15 minutes! Came down like crazy. I am looking east from my house and can see the massive thunderheads 45 miles away as I have a clear sky. Doesn't look good for here. Same story as always, seems like everything will pass North or South of Lancaster county. The one cell that MIGHT skirt the Northern edge of the county is weakening. My god this always happens. What a nasty hook echo in Northern Saunders County. That may produce a decent tornado. That's it. I'm done. I quit weather. This always happens. Right in between everything. Radar looked promising but it broke apart just in time. Hate to sound like the severe weather version of Snowlover but this happens to us for any given weather event. Looks like you may be missed to the southeast and northwest. I feel for you. Same thing here the last 2 days. Hoping for better luck next time. Problem is the cold front set up a county North of where it was originally supposed to. Hoping that gets made up for tomorrow and the severe wx ends up being North again. Don't worry, all of us here in Omaha feel your pain with the weather once again! Heck here on the southwest side of the city, it rained for a whole three minutes... oh well, maybe something can still form this evening or overnight around here, and then onto tomorrow. This sums it up guys, that darn platte river played its hand again as the storms stayed just to the south. Was good for me as I'm located just to the south; glad I missed out on the baseball sized hail that fell in Butler County. Received 1.6" of rain. It's always hilarious how the Platte acts as a forcefield for weather. Nothing is ever able to cross the Platte, heaviest rain/snow must stay North or South. While I did get a bit of thunder and a few seconds of pea size hail this morning, it was a tiny, very brief cell that only dropped a few hundredths of an inch of rain. Everything else has gone around me today... mostly north. What a day in Kansas! Somewhat disappointing in the end, but plenty of action. First came upon a previously tornado warned storm from the north and had to let the hail core go by us. When we came around the back side of the storm we had very rapidly rotating wall cloud and 2.5"-3.5" hail stones all over the place. The wall cloud fell apart, and we continued on with the storm. We eventually got out ahead of it on I-70 and were filling up with gas with about 40 other chasers north of Ellsworth, when suddenly another large funnel formed to the southwest. This one came 2/3 of the way to the ground before falling apart as well. We continued on with this storm having to go a way ahead of it on I-70 before the next exit that would allow us to go north. We went north maybe a mile or 2 off the interstate with the main action still to our north a bit. However, we suddenly had an area of rotating rain curtains come at us from the southwest, so we jumped north a bit. Got out of the car, and was basically right under this rapidly rotating area just to our south by about 1/4 mile with the rotating rain curtains. I kept watching for something to come down but didn't see anything. Soon we got blasted by RFD though and I knew this thing was close to producing as it moved to our east. This tornado was the wedge of the day as it passed near several small towns in north central KS. We finally got back to a highway and blasted east as a new area of circulation formed and the original tornado occluded. We were able to see the white tornado as it roped out about 10 miles to our north but we flew east towards Bennington KS where the new circulation was going just to the north of town. Here again we had to take gravel roads which were ok. It was almost dark now though and we were able to see one more back lit by lightning funnel before we ran into a dead end road. At this point we started back west where we ran into pure slop and was sure we'd end up in the ditch. Saw about 3 other chasers that did end up in the ditch after sliding off the road. Eventually made it back to pavement and now am in Wichita for tomorrow's chase! Will post some pics, etc later! Snowlover's gone. You can quit the troll spiel. It's a balmy 71F with a noticeable increase in DP's this morning (51F). 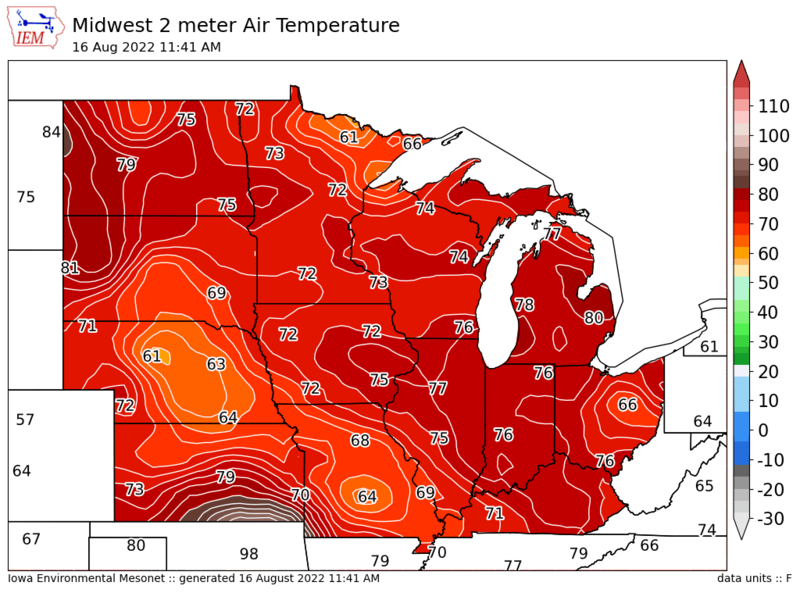 You could have fooled me that we time warped into late July/early Aug. Feels great actually and quite excited to see some storms tonight into tomorrow. 00z WRF, which nailed yesterday's event, is showing a nasty bow echo forming out of KS and tracking close to LNK around dinner time today and into the KC region. In other news, for those who follow the suns solar activity and the impending solar minimum, today's write up on Spaceweather.com was one of the more interesting ones I've read this year. It appears the sun is falling asleep much quicker than NASA's models and forecasts. Is it a surprise NASA is sending a mission to our biggest star this summer?? You can find the link here for this mission to the sun. The fact that our gov't is taking a big step into studying our sun is of great importance for humanity. Something is brewing and we will all be effected by the suns activity. Picked up about 0.2” of rain overnight with the storms. Had a few close lightning strikes but was otherwise just a garden variety storm. The rains really greened up the grass. I don’t use fertilizer because of the lake so I’ll take all the natural green I can get. * WHAT...Snow occurring. Plan on slippery road conditions. Additional snow accumulations of up to an inch are expected. * WHEN...Until 11 AM today. * ADDITIONAL DETAILS...Look for reduced visibilities at times. Oh NOW the cold front moves way South. If it had done that yesterday we'd have had severe weather. That thing looks nasty as it develops more and more. Some thunderstorms over the next couple of days here IMBY. Turning cooler by the weekend w plentiful sunshine. Never was a believer but seeing this play out more and more is turning me into one! I'm not liking the way this is going. First, we basically get nothing yesterday overnight through this morning, so round one was a dud. That's not a huge deal, though, because tonight was supposed to be the big night. However, now the models are trying to shift everything south. The 12z 3k nam has tonight's big storms and heavy rain down in Missouri, for crying out loud. It had looked good for widespread 2-4 inches of rain around here. Now, I'm concerned we may not even get 1 inch before the system leaves late Thursday. The 3k nam has no rain here through midday Thursday. ZERO!!!! As dry as it has been, that would be a kick to the nuts. Hmmm, where do you suppose the front is located?